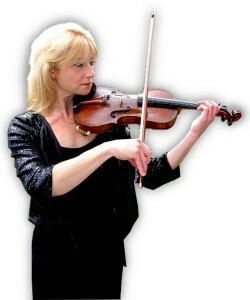 Kate Kingsley, lives in Yeovil, Somerset, and is a professional violinist and violin teacher. Kate’s performing experience has included playing in several of the London Orchestras as well as backing Elton John on one of his tours, Frankie Lane and several other celebrities. Solo performances have included concertos by Mendelssohn, Bruch and Mozart as well as many other solo repertoire. She teaches from beginners to advanced students as well as adults of all standards and have done this for over twenty five years. Lessons are structured to suit individual requirements and include practising technique and preparation for performance and graded examinations. Please contact Kate on her mobile 07964 942848 or use the Feedback form. Also click here for an experienced brass instrument teacher, or click here to visit a brilliant online shop for musically themed gifts.